Castle of Our Skins, a performance and educational ensemble, will do a three-day residence at Keene State College this week as part of Black History Month. KEENE -- The Boston-based chamber ensemble Castle of Our Skins will perform "Hot, Cool and the Boogie Woogies" as part of Black History Month celebrations at Keene State College. The 7:30 p.m. show Friday at the Redfern Arts Center on campus will feature works by African American composers Florence Price, David Baker and Samuel Coleridge-Taylor. KSC faculty pianist Christina Wright-Ivanova will perform with the group. Tickets are $25; $7 for KSC students. For information, visit www.keene.edu/arts/redfern or call 358-2168. 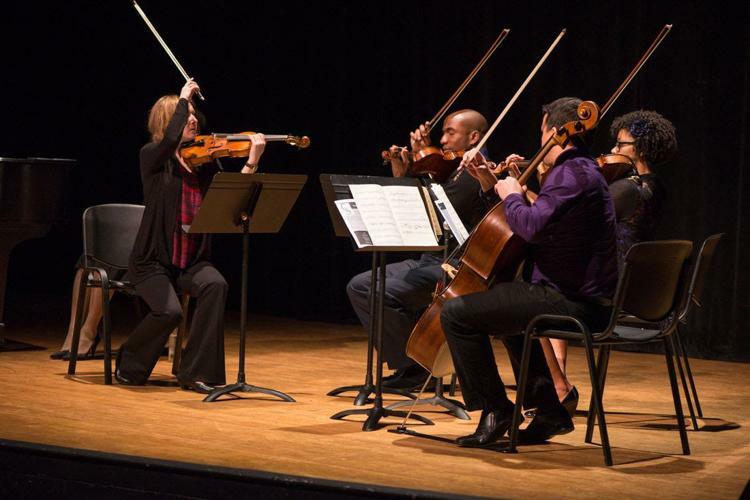 Castle of Our Skins is a concert and educational series formed in 2003 by violinist Ashleigh Gordon and composer/performer Anthony Green, and dedicated to celebrating black artistry through classical music.